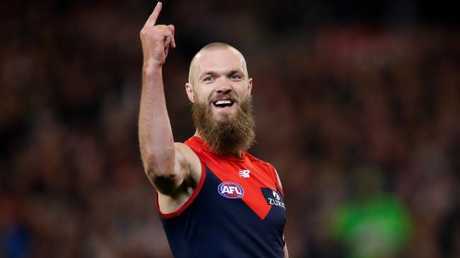 THE prospect of facing two against one doesn't daunt Max Gawn, with the All-Australian ruck relishing the prospect of taking on what he sees as one of the most dominant rucking duos in the game this Friday night. Hawthorn employed two rucks in its qualifying final loss to Richmond last Thursday; Ben McEvoy and Jonathon Ceglar. Demons star Gawn said he will endeavour to do some homework on the pairing, and take a leaf out of his Tigers counterpart's book. "I've got to take in on face value that (two ruckman) what they'll bring," Gawn said. "I'll watch a little bit of what Toby (Nankervis) did. I reckon it was relatively even on the night. "Ceglar's a great ruckman. I really rate what he can do in terms of his craft, and Big Boy (McEvoy) is an elite runner, really good marker and a capable ruckman as well. "They're probably the best duo when they get up and going - maybe (Nic) Naitanui and (Scott) Lycett as well - it's going to be an exciting game." 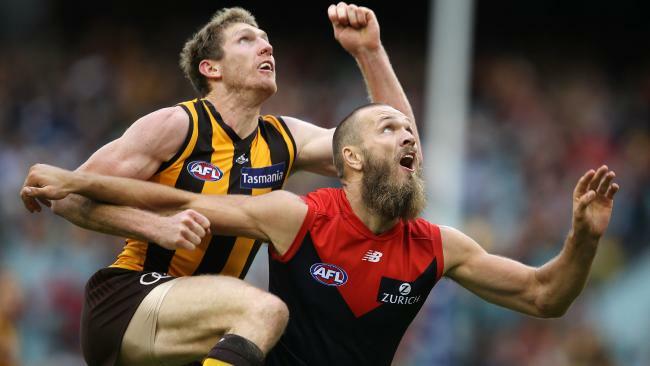 Melbourne spent the weekend recapping its win over Geelong, meaning it has all week to prepare for the Hawks, a schedule Gawn said was foreign, but one he liked. "It's a fresh start, and all the boys are pretty excited to learn a bit about Hawthorn rather than re-cap Geelong. We did that over the weekend," he said. "I'm not sure what sort of prep you need to do for a semi-final … because I've never played in one." Gawn, 26, admitted he was at times tested by Cats youngster Ryan Abbott on Friday night, and said he felt no extra pressure having been anointed as the game's top ruckman over the bye week. Friday night marked his first final, and Gawn said it simply gave the Demons a taste of what they want to achieve. "I have a 100 per cent finals record," Gawn laughed. "I'm one from one … which hopefully goes to two from two this week. "It's important for us to play finals, it was important for us to win a final and it's important for us to keep going in finals. "All six teams can probably win it here - Richmond are probably a bit ahead of everyone else - it's cut throat and we've played three elimination finals pretty much already with West Coast and GWS. "We're getting used to the big stage and I think some of the boys are starting to enjoy it."